The Irish name Cnoc Fola only applies to the hill and not the headland, which is called An Reannach Rua [ET]. Cnoc Fola is the 1120th highest place in Ireland. Decided to tackle Cnoc Fola on 07. November 2012. I had been driving along the W coast from the Rosses and made a complete clockwise turn around the hill to find a convenient spot to park and start from. Finally parked on the northern edge of R257, beside a house, at B827329 E (the white spot in the centre of the picture is my car). Right on the other side of the road lies an open peat field and beyond stands Cnoc Fola. I met a local who was out for a walk along the road with his dog, so I asked him if anyone would bother me walking through this field. He said no-one would, and told me it was a 30-40 min ascent to the top, really worth the effort. After a few minutes jumping from mound to mound on a boggy, uneven terrain, I headed up straight on as the ground rose steeply, until I realised I could make an effortless, diagonal ascent heading SE, as the strong winds literally pushed me up straight to the trig point !! 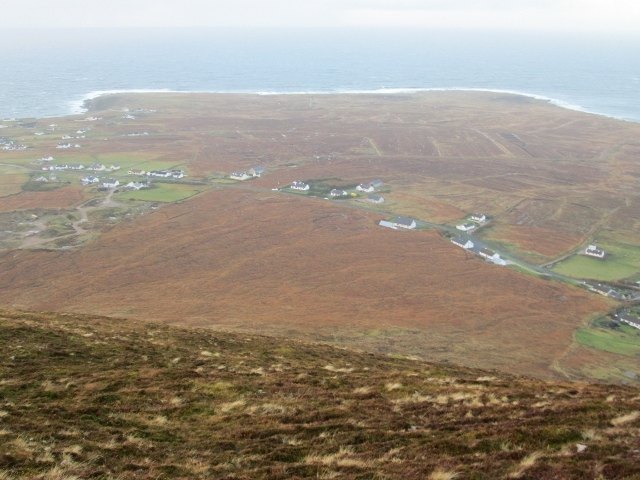 Due to its prominent, isolated position, Cnoc Fola offers amazing 360° views despite its rather modest height. From Bloody Foreland, Tory, Inishdooey, Inishbofin, the endless sandy beach at Dooey and Horn Head to the N and NE, to the amazing string of countless islands and inlets to the SW, with the ocean waves glittering under the fading sunlight that was peering through the clouds. Too cloudy, though to enable me to enjoy the beautiful sunset I had expected. Also to the S did the clouds cover the whole Muckish-Errigal range, leaving only Taobh an Leithid merely visible. Which made me think about coming back on a clearer day ! !